Many of our artists will tell you, when you get a tattoo at Hart & Huntington, you’re not just paying for a tattoo. You’re paying for the artist’s talent and time, yes. But you’re also buying a tier-one experience with an iconic brand, in a clean, fun atmosphere. We never stop investing in our shops and in creating spaces where people want to be. So after a few years in our Orlando location, it was time to begin a refresh. We began working with Kimberly Coombs, founder of KBCO Design, to help give our shop the facelift and space adjustment it needed. I engaged with Hart & Huntington through their architect. Chris, the co-owner, set up a meeting. He’s so nice and personable. He really understands design. As such an edgy tattoo brand, I didn’t know what to expect. I’m really thankful he is great to work with. Before she even began, Kim started with research. Researching the tattoo culture was fascinating to me. Today, it’s so popular across all cultures and it’s spreading across all boundaries. Kim takes a unique approach to interior design. It’s not just about the art or paint on the walls, it’s also about the space–how it feels, how it works for the business and how it flows. I look at how to form spaces, not just add finishes. For Hart & Huntington, efficiency of space is key. My team is making sure we can make a lot happen in that space. We will add new stations and help make the ones they have now work better. We’ll add private stations too. And most important, we’ll focus on giving the team a great place to work. As for the walls, she plans to lead with the legend, himself. 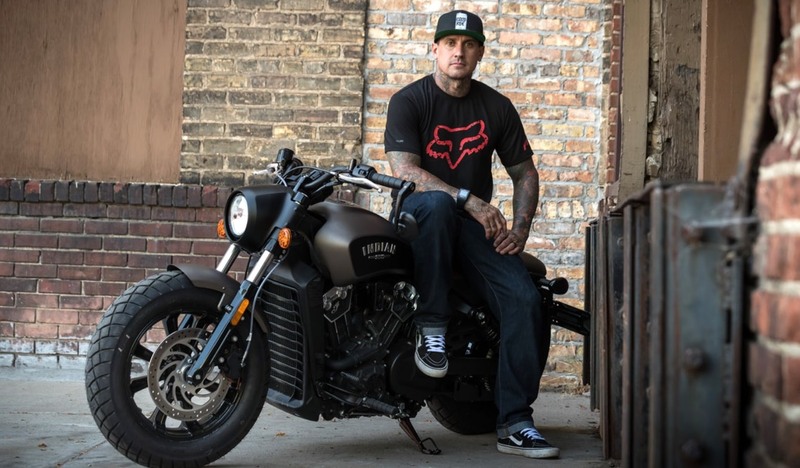 Carey Hart is an icon. So I thought, how can we make sure that people feel that this is different than a typical tattoo parlor? I made sure we’ll have a big graphic on the wall of him, right when you walk in. And we’ll compliment it with black and white art and photography around the shop, celebrating the art community. Kim’s team is working with our co-owner Chris’ vision, while executing a design that will not only make the space work better but also make the shop appealing to the hundreds of thousands of people who walk by each day. In the end, we’ll give Hart & Huntington more space and a better space for customers to see as they go by. It will have a good mix of Motocross, industrial vibe, tattoo shop and theme park appeal. The refresh is just what we need as our business continues to grow and evolve. So is Kim and her team. We are so excited to be a part of the redesign. We consider our clients our friends, and we’re happy to add Chris and the people at Hart & Huntington Orlando in there, too. It’s only phase one so check back, we’ll post pictures as it comes along. No. No. No. There were a few ‘no’s’ before Universal CityWalk said ‘yes’ to Hart & Huntington becoming a part of the world attraction destination. But Chris Turck didn’t let the ‘no’s’ get in the way of what he knew was a great idea.